1949 marked the beginning of one of the most prominent car periods in history. The American Muscle Car era was born in answer to the demand for faster cars in the fifties. A call for lighter bodied cars with more powerful engines for the Moonshiners, encouraged racing on Daytona Beach in California and inspired the beginning of NASCAR. A rise in popularity of racing these cars inspired the entrance of the Gran Turismo Omologato (GTO) and the Mustang to the Golden Age of Muscle Cars in 1964. The Pontiac GTO was approved for racing and American culture rose to the occasion with an era full of the Beach Boys, drag racing and strip racing. Later, Big Block engine muscle cars such as the Chevy 454 and the Corvette L72 427 grew higher horsepower competition. American cars (Mustangs and Camaros) were made famous in Australia in the late sixties and early seventies by motor racing drivers, Allan Moffat, Bob Jane and Pete Geoghegan. They won multiple championships in these loud, proud US cars including the Australian touring championships and other flagship motor sporting events. Nowadays, American Muscle Cars have a large following in Australia with social media interaction including blogs, forums and social media groups. The Gold Coast Muscle Car Association is present right here in our backyard and there is little danger of the Golden Era of American Muscle Cars being forgotten. Lot 17 is a 1969 Chevrolet Camaro Coupe Twin Turbo. A sleek metallic black with racing stripes. It is completely custom smoothed, stretched and widened. It is a two door (suicide) coupe complete with a roll cage and a six-speed manual transmission. The roll cage is not visible due to the custom roof console and pillars. Lot 18 is a 1967 Chevrolet Camaro Coupe with a 572 Big Brock High Performance V8 engine. It is a two-door coupe with a power shift automatic transmission. The four seater is black in colour. Lot 21 is a 1969 Ford Mustang Fastback 428 Cobra Jet with a V8 428 Cobra Jet Mach 1. This car was known for having the biggest V8 engine available at the time. The engine was the most reliable, durable and high performance on the market. It has an Automatic C6 transmission. It is fully operational with the vehicle having sat in a museum for 25 years in Texas and imported into Australia in 2011. It has matching numbers with everything original from motor, to the body and Candy Apple Red Paint. The vehicle is complete with 9” diff, air conditioning, radio and rear louver window. Lot 22 is a 1968 Ford Mustang Fastback with a 390 V8 petrol engine. The silver, grey car seats four and is a 5-speed manual. It has had a full restoration of its body and panels by Hills & Co of Taree. 500+ hours of labour have gone into this car including engine and suspension fully rebuilt by Des Moy from Forster and upholstery by Trick Trim Forster. It has had an alarm fitted and includes a Copy of USA certificate title and an Import Approval Copy. 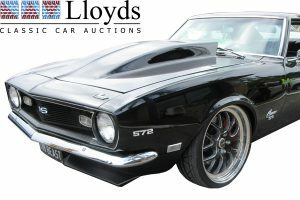 To view details of the ‘Born in the USA’ American Muscle Car Auction simply visit our Lloyds Classic Car Auction page.